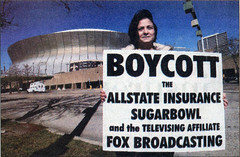 Unlike Jeri Schneider-Kneale pictured above (photo by Matt Rose), I will be watching the Sugar Bowl. After all, I payed about $100,000 for the damned event. That is roughly how much money Allstate owes us for the structural damage to our house, and they decided to spend that money on marketing. I guess it makes good business sense, at least as long as they can get away with it. "Allstate's new four-year deal for an undisclosed sum to be title sponsor of one of New Orleans' signature events comes at a time when the company is one of the more controversial businesses operating in Louisiana. Allstate has clashed so much with state insurance regulators throughout the year over its rising insurance rates that the Louisiana Insurance Rating Commission held a special hearing earlier this month on Allstate's business practices. Meanwhile, Allstate is one of only three insurers along with Lousiana Citizens Property Insurance Corp. and the St. Paul Travelers Cos. Inc. whose ratios of complaints to the amount of business it does in the state were high enough to trigger an investigation by the Louisiana Department of Insurance. Indeed, while Sugar Bowl organizers are thrilled to have a company as major as Allstate picking up sponsorship of the event after Nokia's contract expired, they acknowledge that those who suffered hurricane damage may not share their enthusiasm. 'I wouldn't say it was because of Hurricane Katrina that we sponsored the Sugar Bowl,' said Mike Trevino, national spokesman for Allstate. 'The opportunity presented itself, we were interested in expanding our relationship with college football, and it was in keeping with our marketing strategy to carry forward the brand.'" Allstate has also put out a full page advertisement in many newspapers across the country. It starts off saying that "When it takes 288 years to build something as unique as The Big Easy, you don't let one hurricane tear it all down." The ad then brags that Allstate is helping return residents to their homes. No they are not. 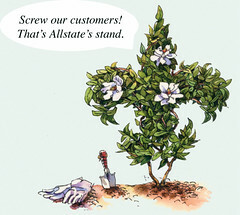 The advertisement ends with this fleur du lis bush that Allstate supposedly planted. I photoshopped it just a tiny bit. That fleur di lis looks like a big green chicken. Sugar is Sweet But Saban is Sweeter.